With so many social media platforms to choose for digital marketing LinkedIn may be one that you haven’t considered yet. Most people consider LinkedIn different from other social sites simply because of how they think it should be used. Generally, the perception is that it is reserved only for networking and creating professional connections. And this may be somewhat true, but with over 500 million members, LinkedIn is one of the largest networking sites in the world and there just may be more to the platform than you think. When people think of Twitter, Facebook or Instagram they know each platform and work within them on a more social level. However, LinkedIn Is considered to be more of a buttoned-up, professional site. But truth be told, you can use LinkedIn socially as well. With Facebook or Instagram, you are more likely to post updates on your daily activities and pictures of your latest vacation. Now, you can do the same with LinkedIn, however, this comes with a caveat. While you can create posts on LinkedIn showing snippets of your life, you may want to keep the potential audience in mind. Remember, that most users on LinkedIn will tend to stay within the confines of what they think the platform should be. You can go off course a little, but just remember that it could be a potential client or future employer who sees it. The primary reason to consider using LinkedIn in a more social way is so you can make better, more meaningful connections with others. In a way, LinkedIn can be described as showing everyone on their best behavior and that could make you seem unrelatable. If your end game is to use LinkedIn to grow your business, you should consider posting content that is human and real. After all, it’s hard to make a connection with a resume. That said, everyone knows LinkedIn is a great platform for marketing and networking because it’s applicable to basically any niche or industry. Using LinkedIn allows you to make connections with professionals like yourself and you can optimize your page to show in search engine results as well. Overall, LinkedIn helps you to gain exposure for your brand and establish yourself as an expert in your field. And all of this can happen on one page. You may want to think of LinkedIn as yet another home page for your business. Your LinkedIn profile is where you can showcase your experience, your education and make professional connections. When filled out completely and done right, LinkedIn profiles can rank very well in search engine results too. At the end of the day, having a profile on LinkedIn can allow people to find you quickly and put a face to the name when they do a simple search on Google. For example, once you create a profile on LinkedIn you may find that you can Google your name and your LinkedIn profile will show up on the first page of results. If you could easily find you than a potential client can easily find you as well. Once you create your LinkedIn profile there are a few things you can do to optimize your profile. The first thing you want to do is choose the right photo. It should be professional, positive and looking at the camera. And for goodness sake, in this case, you do not want to post a picture of yourself hanging out at the beach. This is where LinkedIn is quite different from other networking platforms. You are not trying to show how much fun you’re having while you seize the day. You’re trying to convey some degree of professionalism. And for that reason, the photo that you use should be a professional quality, close-up headshot. And please, no matter how tempted you are, do not use a photo of you and your new puppy. The same goes for old Glamour Shots photos or anything that includes someone else. LinkedIn photos should reflect you, and ONLY you. And when in doubt, here’s how to take a great professional photo, even if all you have is your cell phone. Your headline should also be optimized. The headline is the blurb underneath your name and it should tell the person looking at your page what you do or what industry you are in. Job titles work very well here (therapist, coach, author etc) as do credentials. And in the case of credentials, your most important one (maybe two) should lead the show. Having a proverbial alphabet soup after your name does no good for search engines. Use the rest of your profile to detail out your education. Remember, you’re not posting a CV, but a social profile that incorporates your education + resume + a little bit about you personally. More on that below. Your contact information should be filled out completely as well. Be sure to include your phone number, your email, and your website URL. Once you start networking and making connections it is crucial to give potential clients a way to contact you. If they cannot contact you easily, they can simply move on and contact someone else who’s information is easy to find. It may go without saying that you should exclude anything you don’t want the world to have access to. LinkedIn offers a great PRIVATE email service to people you’re connected to, so posting your email address is often discouraged to limit spammers from grabbing it and spoofing your address. Your LinkedIn summary is where you should put most of your time and effort when creating your LinkedIn page. This is where you would most likely communicate your expertise and knowledge in your field. When writing your summary, be sure to use factual and objective language, flowery and verbose does not work here. Also in your summary be sure to use relevant keywords that will allow people to easily find you. Keywords are always a discussion with clients we work with, and what you want to include here are terms, phrases, and wording that matches how people actually search for whatever they’re looking for. The best advice is to step into the shoes of the person you most want to find you on LinkedIn and ask yourself, “what are they looking for” and “how would they enter that into the search box”. Then, use those phrases in your profile. This matching up of their search and your usage of the words is the beginning of a very smart SEO strategy. If you want to know more about that, visit this article for more. The great thing about LinkedIn is that you can you add up to 25 skills and endorsements to your profile. Essentially, this section functions like your resume; it’s where you tell people about your detailed education, skill set and perhaps, more importantly, you can include testimonials of past clients or colleagues. For many therapists, asking for testimonials is considered unethical. But, if a colleague or workshop participant were to endorse you, that would feel much different. The section for recommendations is especially important when you’re looking to establish your reputation. As a consumer, seeing what others have to say about your work, ethics, performance or history in the field is an open invitation for truthful exploration. Here others can “say their piece” about how great you are and how wonderful you were to work with. The key to any marketing strategy is to define your audience and define your goals. The general rule of marketing is that when you talk to everyone you end up talking to no one. Marketing must be very defined and specific. Many of us think of this as “defining your niche”. Once you know what you want to accomplish, you can then set about finding the right audience. For example, if you wrote a book on leadership and that’s what you are trying to promote or sell, you can then target the right audience and focus your efforts on mid to upper-level management profiles on LinkedIn. If you have a podcast you want to gain more listeners to, you can target your posts and profile to the expertise you have helping your listeners. Remember that everyone searching online begins their outreach with one important fact: they use the I pronoun. In other words, they think of themselves and their needs. If your marketing is too tied to what you do without reflecting back your connection to the needs that others have, you will lose out on meaningful connections. The great thing about LinkedIn is that all the information you need to find that audience is right in front of you. Not only is it easy to find, but it’s completely accurate because the information was added by the members themselves. Take time to review LinkedIn profiles from your heroes and other people you admire. How do the express their expertise? How do they reflect back their abilities to help their selected audience? Consider how you can do the same for your niche and then add it to your profile. As with so many other things on the internet (like your website for example) SEO or the use of keywords is also an important consideration for your LinkedIn profile. As I mentioned earlier, your LinkedIn profile can rank in google search engine results — but only if you properly optimize your page. Be sure to use keywords in your headline, your summary and also use them strategically within the experience section of your page. Using keywords in these sections will ensure that you consistently end up in the return for a particular search term. Not sure what keywords to use? Think about what your business is about, what you do, and the services you offer. What words or phrase would someone type in when looking for the type of service you offer? LinkedIn is no different when it comes to posting content in the sense that it must be engaging and capture the reader’s attention within a short time frame. However, there is one very interesting difference that allows LinkedIn to stand apart from other social media platforms. According to LinkedIn’s Marketing Solutions Blog, LinkedIn is where over 100 million decision makers and executives for most Fortune 500 companies spend their time. And any time they spend on the platform, they are actively looking for valuable content to read. So your goal here should be to post content that is interesting and valuable to potential readers. When it comes to LinkedIn, it’s users aren’t necessarily buying a tangible product. Much like what we talked about regarding Instagram, they are “buying” your solution to their specific problem. However, in this case, you are offering solutions that primarily revolve around their professional life. For example, as a therapist or a coach, valuable and engaging content on your LinkedIn page looks like content about getting over the fear of public speaking, how to learn great communication by practicing it at work or articles about leadership skills. 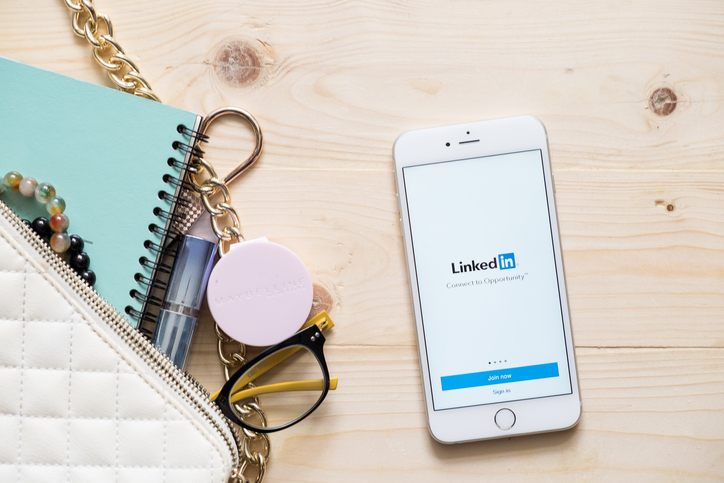 Many people classify LinkedIn solely as a professional networking platform, however, LinkedIn is also a social media platform and that’s one of the core takeaways from this piece. Your goal on LinkedIn is to build a network of trusted professionals and convey your education and expertise to potential clients. The beauty of LinkedIn is that you can be “buttoned-up” or relaxed and relatable, the choice is yours. However you choose to tackle LinkedIn, taking some extra time to complete your profile, optimizing your page and posting engaging content can all go a long way toward helping you build and grow your business. Need a social media coach, here’s everything you need to know about hiring one. And, if you need a social media management tool, here’s everything you need to know about 5 very popular, easy-to-use tools we recommend to clients. If you need help creating a social media calendar that increases engagement please subscribe to our newsletter list (located in the upper right-hand column on this page) or reach out to us directly to schedule a call and see how we can support you in your digital marketing efforts.